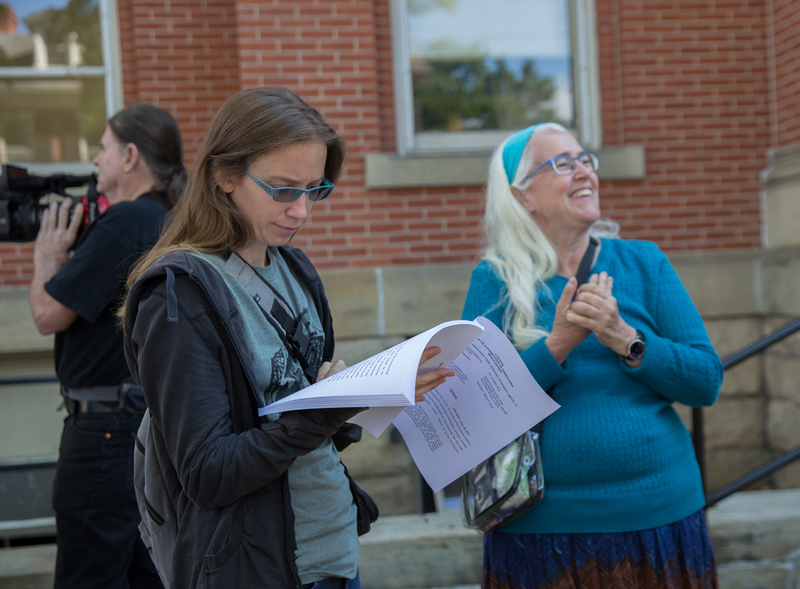 Elise Gerhart (left) reads a 2017 ruling about the environment from the Pennsylvania Supreme Court outside of the Huntingdon County Courthouse with her mother Ellen. Ellen Gerhart, a retired teacher who has led a fight to keep Sunoco from building a pipeline on part of her family’s Huntingdon County land, was jailed Friday after the company accused her of violating a court order that she not interfere with its workers. Gerhart, 63, was arrested on a bench warrant and is at Centre County Correctional Facility without bond on a charge of indirect criminal contempt, according to online court records and the Centre County prison’s records office. Gerhart’s daughter, Elise, said her mother has an Aug. 3 hearing date in Huntingdon County related to a previous allegation that she violated the court order in April. In a Huntingdon County Common Pleas Court filing July 26, Sunoco Pipeline L.P. said that since May, Ellen Gerhart continued to interfere with the Mariner East 2 pipeline site and workers. Among other things, the company claimed she spread spoiled food near the site to bother the workers and attract wild animals; that she started fires that threatened construction fences and equipment, and that workers had to put out; and that she went onto the easement and stood in front of a construction vehicle, forcing it to stop until she left. Sunoco asked that Gerhart’s bail be revoked and that she be found in contempt of court. The charges are not true, Elise Gerhart said Saturday, and “are not going to hold up in a hearing.” She said the allegations amount to harassment of her mother in retaliation for Ellen Gerhart’s opposition to the pipeline. Sunoco was granted eminent domain to build the pipeline on part of the Gerhart family’s 27-acre property. For a period of time last year, Elise and supporters of the family built and lived in tree houses on the construction site to prevent the company’s work. But a county judge ordered them out of the construction area. Construction is continuing on the site. Mariner East 2 is being built to carry natural gas liquids from the Marcellus Shale of southwestern Pennsylvania to an export terminal at Marcus Hook in Delaware County. The company has said it will be operational in September. Update 7/30 5:16pm: Ellen Gerhart appeared in Huntingdon County court Monday afternoon and now has a $25,000 cash bail which she cannot meet, according to her daughter Elise, she will remain in jail until next court appearance Friday.